Having a food processor amongst your kitchen appliances is the one of the best things you can do for yourself and your family. With a quality food processor at your disposal, cooking up storm can be a daily affair without breaking a sweat. This is because the repetitive vegetable cutting and chopping, flour kneading, nut grinding involved in ingredients preparation can now be tackled using a food processor that will have your ingredients ready in a snap. No elbow grease needed there! The question however to answer is; what would be the best one to buy when there are so many of them out there? Read on to find out the best offerings as we delve into our top five selection of the best food processors in the market today. Cuisinart has become a trusted brand that a great number of households are more than happy to have. Their quality and practical kitchens appliances are not just popular, they are preferred. 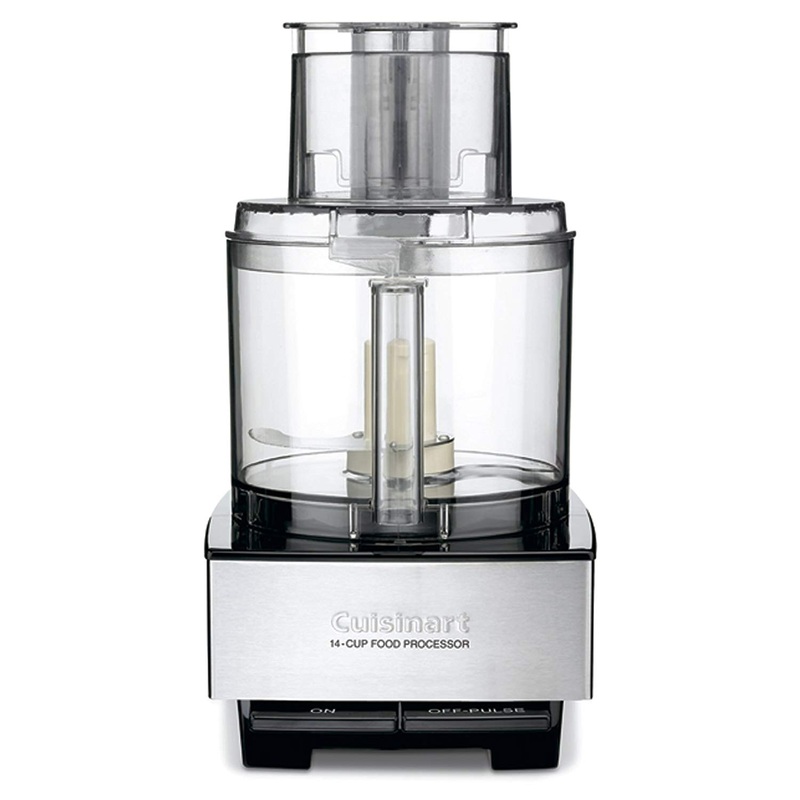 The Cuisinart DFP-14BCNY 14-Cup Food Processor is heavy duty and the phrase workhorse is apt when describing this food processor because of its resilience. It also has the ability to make all manner of cooking prep work a breeze. For instance, if you love to prepare meals that involve dough, you will probably agree that kneading dough manually for a meal of 10 people can be quite a task as you exert yourself physically to pound, knead and squeeze the dough to compliance. With this food processor kneading the same amount dough or even more will literally take only a few minutes and you achieve the exact consistency you are looking for. The feed tube is an important part of a food processor for safety reasons. It protects your fingers as you slide in ingredients that you need chopped, sliced or ground. In this machine the tube is conveniently extra wide to allow whole fruits among other sizeable foods to be passed through. It also means that you don’t have to bother with cutting of ingredients before you slip them through. Two fairly sized onion bulbs will comfortably slip through together side by side with a lot of ease. This tells you that all ingredients you can think up can be inserted through the tube with little to no regard for size. The 720 watt motor will whir away anything you need prepped from chopping whole fruits, vegetables, kneading dough, grinding nuts, shredding cheese or shredding meats. When it comes to food processing, size does matter. With this particular food processor the 14 bowl capacity really works to your favor if you have a big family or you are one for inviting friends and family over for the weekend as you cook up a storm. One obvious benefit of a good quality food processor such as this one, is how it empowers you to turn an ordinary meal into something marvelous in terms of what you do with simple everyday ingredients to add flavor and garnish to a dish. As a matter of fact, it allows you to use some ingredients that you never thought possible or simply steered away from because of the prep work involved. The blades on this Cuisinart product are stainless steel and are truly a work horse. They can slice easily through simple ingredients such garlic and veggies but they are strong enough to work a batch of dough to just the way you need it. The versatility of this food processor is remarkable. It can accomplish chopping, slicing, pureeing, kneading, emulsifying and mixing dough with surprising ease. This appliance does not only make your food processing prep work easier but it also looks great on your kitchen counter and does not hog all your counter space. The brushed stainless steel exterior and makes for easy cleaning, ensures durability as well as a sleek look that complements the decor of your kitchen. The Cuisinart food processor, ticks off all the right boxes from elegance and durability to large capacity and power. If you are looking for a quality food processing appliance at an affordable price, it is hard to beat this one. 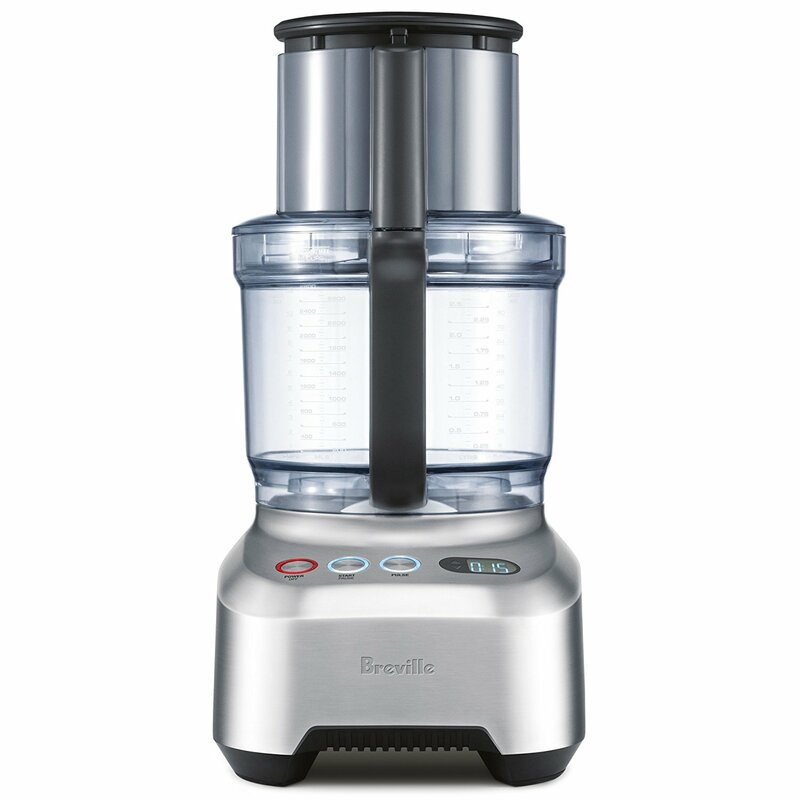 In terms of features such as capacity and power, the Breville BFP800XL takes it to another level. The company behind this kitchen appliance is Breville, an Australian company that has been in existence for more than 8 decades. In those 80 plus years of making and perfecting kitchen appliances it has provided kitchens worldwide with quality products so it is no wonder this food processor is something special. The design is quite funky and would look great on your kitchen counter. At first glance it gives the impression that whoever owns such a food processor must be very serious about whipping up delicious meals. The sous chef comes in three colors to choose from that best complement your kitchen. These are stainless steel, black sesame, cranberry red. The Breville BFP800XL gives you the ability of turning ordinary recipes like pizzas to tantalizing dishes and it also allows you to now use ingredients that you would not give much thought to such as fruits, cheeses, shredded meats and so much more. Its construction features a die- cast metal base for stability and a plastic bowl that is both easy to clean and durable. The Breville sous chef tube feed has been made extra wide. With a diameter of 5.5″ inches you can now easily fit different types of ingredients with ease without having to do too much cutting before you feed them to the food processor. The Breville Sous Chef boasts of 24 different cutting settings that can be used across a set of 5 discs and 3 S-shaped serrated stainless steel blades. The cutting options range from a paper thin 0.3mm to a chunky thickness of 8.0mm. The powerful motor that drives the discs and blades is 1200 watt. This is more than adequate power for light or heavy duty use. This appliance comes with 2 bowls. One is a mini bowl accommodating 2.5 cups when making smaller meals, while the other bowl has the capacity to accommodate a whopping 16 cups. It can be used for huge families, parties and even restaurants. With this high powered motor, chopping, shredding, pureeing and kneading have never been easier. Thanks to the invention of such a food processor, you no longer have to slave away over meal prep and can now create more time to enjoy sumptuous meals with your family. Safety is always a key aspect in any kitchen appliance. The Breville BFP800XL ensures that the machine does not run unless the bowl, lid and pusher are firmly locked in place. Liquid ingredients are also locked in with the help of silicone seal that prevents any leakage. The Sous Chef comes with 8 high precision tools to enable you to be efficient and precise in your food processing. Amongst these tools are an LCD display and a timer. If your cooking needs in terms of quantities and frequency require some awesome power and a heavy duty food processor, then you and the sous chef will get along just fine. Consumers deem it expensive for a food processor, but if you look at the quality, features and customer reviews in terms of performance, then you will see why it costs as much. In our opinion, the durability and consistent performance absolutely justify the cost. The Braun FP3020 is one quality food processor you cannot afford to miss out on especially if you are on a budget. The old adage that says “cheap is expensive” would be wrong in the case of this appliance. This is simply because it provides value for money and affords you the luxury of a functional, durable and practical food processor without having to break the bank. It keeps it simple and with all the basics plus additional features and functions that you will find useful. The design is a little bit unconventional, but this is for a good reason. Whereas the conventional design would dictate just a base with a motor and a mounted bowl with a feed tube, the Braun FP3020 has all that and an extension for juicing on the side, how cool is that? You have got a food processor and juicer, side by side all wrapped up in one appliance. You would think that this inclusion would make the food processor bulkier and heavier but this is not the case. The Braun has a compact fit and looks pretty nice and neat on your kitchen counter without taking up too much space. The Braun packs a heavy duty 600 watt DC motor that has sufficient power for all your kitchen needs. It also comes equipped with stainless steel discs as well as blades and boasts of a 7 speed setting. These ensure all your regular ingredient prep is made easier and faster including kneading dough, whisking, grating, dicing, chopping, pureeing and so forth. The processor’s silent operation technology is amazingly quiet despite chopping or kneading away with great efficiency. This is a welcome addition in comparison to other processors that would not allow you to have a conversation while chopping because of the merciless unyielding din they generate. The bowl is made of durable polycarbonate (plastic) that holds 12 cups of any given ingredients and 9 cups of water. With different speed setting to choose from, you can set the processor from 300 revolution for soft items such as onions to 2000 revolutions per minute which makes fine blending such as making sauces and dips seem like a breeze. Safety is paramount and the appliance will not allow you to operate it unless the lid is secured properly in place. Sometimes it’s not even a budget issue, you might just be in need of a quality processor that is not loaded with too many features that you may not have need for and which is properly sized for to suit you petite kitchen. With the Braun food processor, not only do you get a good price, but all the basic functions that you would need and then some. Features such as silent technology when in operation and high powered heavy duty motor at 600 watts as well as different speeds settings, throw in a juicer in there make it stand out. For its category, it is hard to beat the Braun FP3020 on performance, power, durability and price. 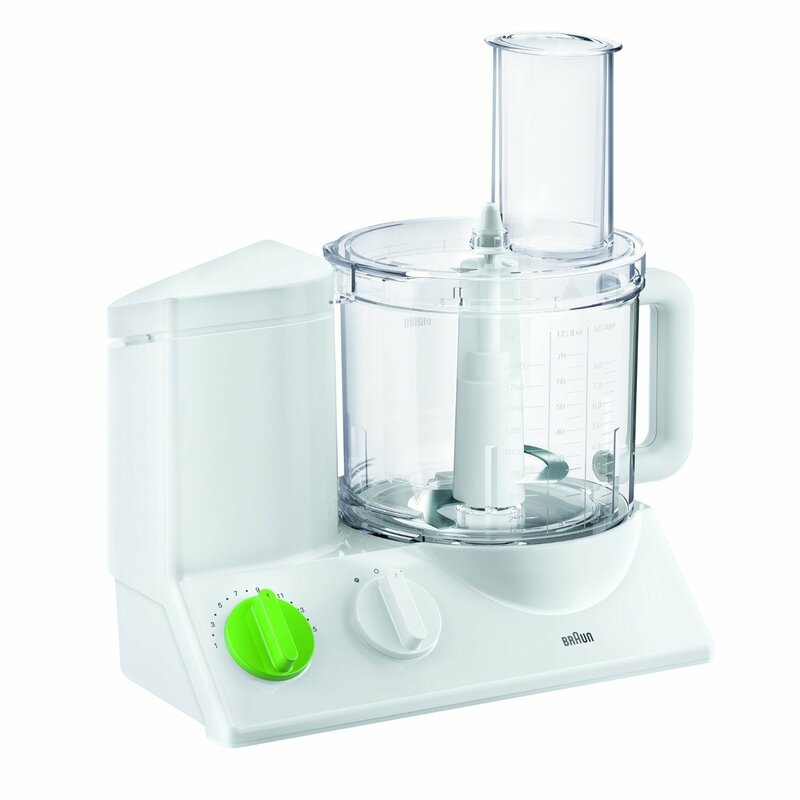 The Ninja BL770 Mega food processor is something special because of its unparalleled multi use abilities. 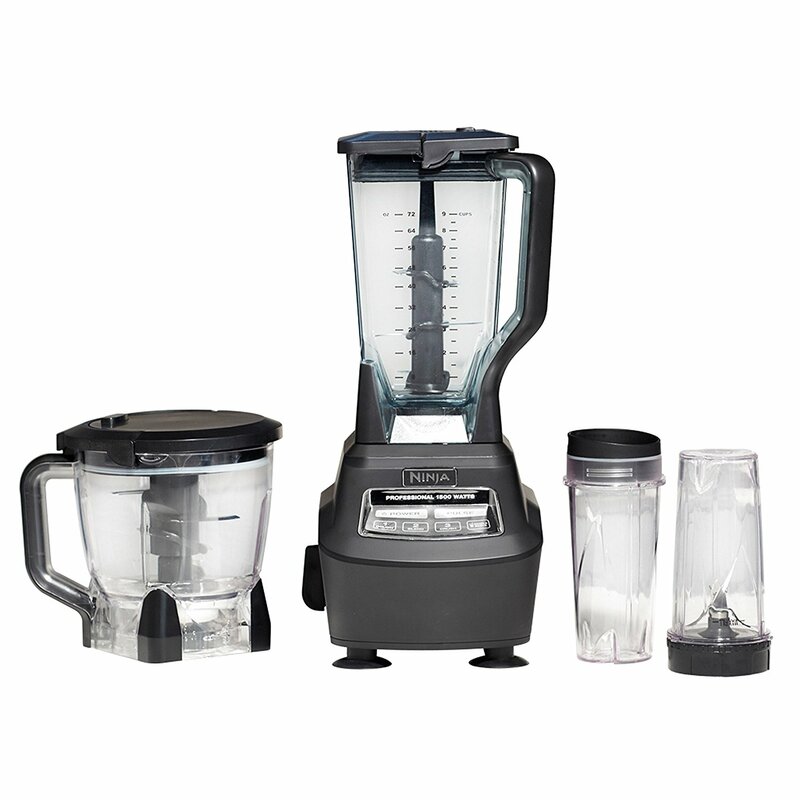 Instead of cluttering your kitchen with 3 to 4 appliances such as a juicer, blender and food processor, get the Ninja and have all three in one. This is precisely why the Ninja has the word “kitchen system” appended to it, because it can do so much. To be honest, the appliance at first looks intimidating, with several bowls and a pitcher as well as other additional pieces. You can easily get the impression that assembly will be a headache. But it is not the case. Having anticipated this assumption among many potential customers, Ninja has plenty of videos on their website that take you through the paces in order to see how to optimize this remarkable appliance. It also comes with a manual to help get you acquainted with all the configurations that the Ninja has to offer. Once you get in the swing of things, you will be glad you have this appliance in your kitchen. It helps keeps your kitchen tidy because all the parts not in immediate use can be stored in the cabinets and reached for with ease when needed. Many consumers have taken the trouble to write glowing remarks about this product because it is such a powerhouse. The motor packs a whopping 1500 watts. This means all you’re chopping, dough making, dicing, pureeing, blending and so forth can be done in no time. 2 pounds of dough can be mixed in a mere 30 seconds. The food bowl can hold up to 8 cups of food to be processed comfortably. For convenience, it also comes with a mini bowl for smaller portions such as when prepping for a solo meal. Equipped with ‘total crushing technology’ the blender can pretty much pulverize any ingredients in a matter of seconds including ice cubes. You can use the pitcher to serve large portions of smoothies or a single cup when you are solo. If you have frequent juicing, blending and food processing needs, then this machine is a savior on your kitchen space and convenience as opposed to buying and working three separate appliances. The high powered 1500 watts is more than enough to power through any ingredient without getting ruined for many years to come. Special kitchen needs require special appliances and it does not get any better than the Ninja to take care of all your kitchen food processing needs for healthier meals. The Black and Decker brand is well known for smart durable kitchen appliances. With this beauty of a kitchen appliance you might want to retire your chopping board because you won’t be needing it. 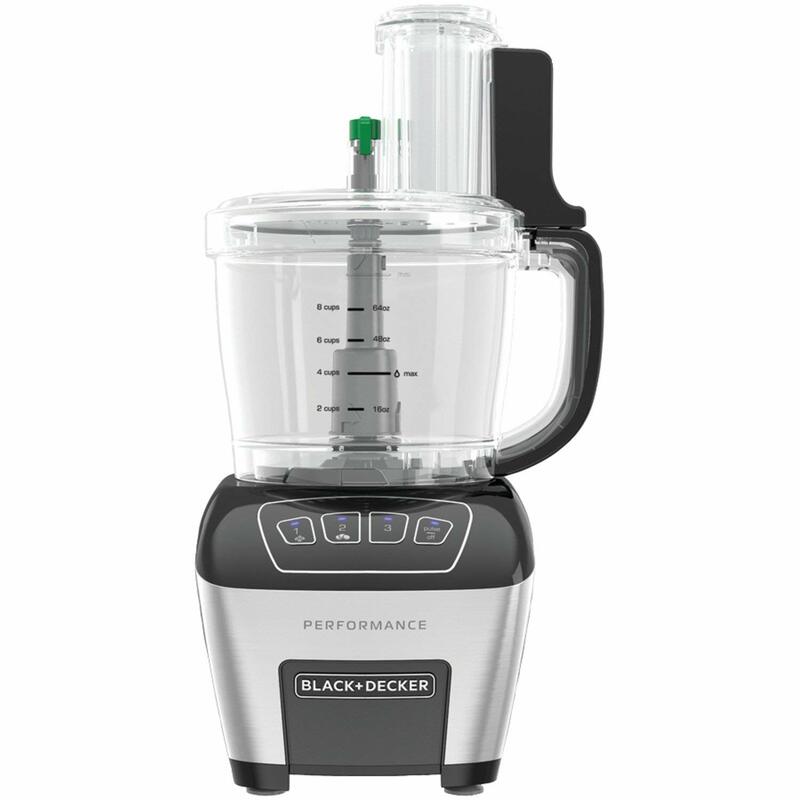 The BLACK+DECKER FP6010 is amazing at cutting, shredding, dicing, kneading dough and blending in snap. It comes equipped with a powerful 800 watt motor that more than accommodates all your food prep needs. It also comes with S blades, disc blades and a dough blade that covers all your food prep work making things easy and saving you loads of time. The discs and blades allow you to dice ingredients up to 8mm and be set externally for thinner slicing for 1-5 mm for stellar food presentations. The feed tube is extra-large and able to accommodate whole fruits and all manner of cooking or salad ingredients without you having to do much chopping in terms of prepping the ingredients for the processor. The bowl capacity is 11 cups for prep work of larger meals, while there is a provision of mini bowl to help you choose an appropriate sized bowl that correspond to the size of ingredients you need to prep. Black and decker is an outstanding brand with a proven track record in making reliable kitchen appliances. The BLACK+DECKER FP6010 is a solid purchase for a quality, durable and consistent results. Your food processing has just been made easier by this affordable quality food processor. A food processor simply makes your life easier in the kitchen and enables you to turn ordinary meals into sumptuous feasts without overly having to exert yourself. Here’s what to look for when considering buying a food processor. Power – This is simply the wattage of the motor that drives the machine. You could argue that the motor is the engine of a food processor and needs to be powerful to yield required results. Depending on your processing needs, anywhere between 600 watts to 1500 watts like in the product reviews above would be suitable. It is worth pointing out that the higher the power in a food processor the higher the cost. Convenience – is an important aspect which can be met by paying close attention to the features that the appliance has, such as a mini bowl for solo preps and a larger bowl for bigger meals. Food processors that have multiple functions such as blending and juicing can be very beneficial if they fit you’re cooking requirements as they save you a pretty penny and counter space when you do not have to buy such appliances separately. You can now make recipes that you would not touch before, for example those that require shredded meat and so forth. Food processors came into the picture around the 1960’s when a gentleman called Robert Coupe introduced this amazing machine. Since then, many a households have clearly realized there is so much to gain by having a quality food processor in the kitchen. The reviews for the Cuisinart DFP-14BCNY are amazing, but is it easy to clean, because no one seems to touch on that aspect? The parts are dish washer friendly and are also easy to clean manually. However, it has been noted by consumers that dish wash cleaning, especially if you have hard water can result in corroding the bowl locking mechanism such that it jams. Replacing it is possible but is not exactly a cheap proposition. Manual washing is better and not all that difficult with the help of a little soap. It’s a small price to pay compared to coughing out dollars for a replacement. Is the Breville BFP800XL Sous Chef noisy with all that motor power? No it’s not. Consumers love extra wide feed tube, because it allows you to process large batches of food at a time. Surprisingly no matter how much you load the bowl, the induction motor whirs away with remarkable power to get the job done in a few blinks. The only noise you might hear is from the contents in the bowl being chopped to smithereens but not a sound from the motor. Impressive! What country is the Braun FP3020 made in? What exactly comes with the Ninja Mega system? Can the BLACK+DECKER FP6010 dice soft items such as fruits? Yes, this device is able to dice fruits such as apples, strawberries, green beans, and so forth to perfect 8mm cubes for professional food presentations. Thanks to affordable food processing options, a food processor in your kitchen is no longer a luxury but a necessity. Although many people may have varied food processing need in the kitchens, depending on whether it is a commercial establishment or your household kitchen, the need to process food in a snap and save on time and effort applies to both settings. With a food processor, you can stop slaving over meals and begin to enjoy your cooking experiences together with your family. It is time to start whipping delicious meals effortlessly.